Cardiovascular disease remains a major concern in the United States. In 2016, the American Heart Association reported more than 800,000 deaths occurred due to cardiovascular-related strokes. More than 500,000 of the cases were first-time instances. Strokes remain the sixth leading cause of death in the country. However, seniors can use the following tips to reduce their risk of strokes. Researchers learned that the people in Mediterranean countries eat much differently than people in the Western world. They also found that many of the senior citizens living in the region lived well beyond their 90th birthday, and reaching the age of 100 was not unusual. The secret lies in the eating habits of the people, which eventually became known as the Mediterranean diet. Meals consisting of fruits and vegetables along with smaller portions of fish and poultry keep cholesterol levels low. The omega-3 fatty acids found in the fish and olive oil also provide cardiovascular protection. Having a professional caregiver to assist with daily tasks makes it easier to switch to a healthier lifestyle. In Huntsville, AL, home care agencies can be a great boon to seniors. With the help of the caregivers at Home Care Assistance, your aging loved one can lead a happier and healthier life. We offer a revolutionary program called the Balanced Care Method, which encourages seniors to eat nutritious foods, exercise and socialize regularly, and focus on other lifestyle factors that increase life expectancy. Routine physical activity is also vital to ensure cardiovascular health. Seniors should get a minimum of 150 minutes of moderately strenuous activity each week. Activities that raise the heart rate can strengthen the heart while encouraging the relaxation of blood vessels. These two factors increase blood circulation and reduce the risk of developing blood clots, which lead to strokes. Caffeine is a natural stimulant that raises the heart rate and constricts blood vessels. Consuming caffeinated beverages throughout the day adds undue stress to the cardiovascular system. Seniors should limit their caffeine intake or switch to decaffeinated coffee and tea. A good night of sleep is vital for the body to completely relax and undergo reparative processes. The lack of seven to nine hours of restful sleep can increase the risk of developing cardiovascular disease and other serious issues. Encourage your loved one to avoid stimulating beverages or activities two hours before bedtime. Instead, he or she should choose activities that promote relaxation and calmness. Exercising during the day also helps the body feel naturally fatigued at night, which makes it inclined to be ready to sleep. Determine whether your loved one’s bedroom is an atmosphere that encourages sleep. Opt for more comfortable bedding if needed, and put room darkening shades or draperies on the windows. According to several studies, poor sleep hygiene can lead to dementia. Lack of sleep damages the brain over time and speeds up cognitive decline. Many families have no experience in specialized home care for seniors, which can make life a bit more challenging when an elderly loved one is diagnosed with dementia. The Huntsville, AL, dementia care experts at Home Care Assistance are here to help. We designed a program called the Cognitive Therapeutics Method, which uses mentally engaging activities to boost cognitive health, and all of our live-in and respite caregivers are expertly trained in dementia care. When the body is continually subjected to high levels of stress, the chemical reactions that take place pose a risk to the cardiovascular system. When tension builds, seniors must find a way to release the stress. Some prefer alleviating stress by working out, while others might eliminate tension by indulging in a hot bath or shower. Sometimes just talking about concerns with friends or family members is a way to find solutions while reducing stress levels. It’s never too early to take measures toward preventing strokes, but some of these tasks may be difficult for your loved one if his or her abilities are hindered due to other health challenges. Seniors who want to remain healthy as they age can benefit in a variety of ways when they receive professional home care. 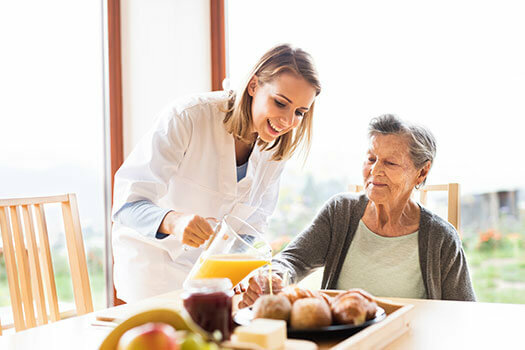 Huntsville, AL, Home Care Assistance is here to help your loved one accomplish daily tasks, prevent illness, and focus on living a healthier and more fulfilling life. Call one of our friendly Care Managers today at (256) 716-9940 to schedule a free in-home consultation.